How infants and toddlers are affected by media is important to their overall health and development. This tip sheet will help you understand how media can positively and negatively affect how they think, act, learn and grow. 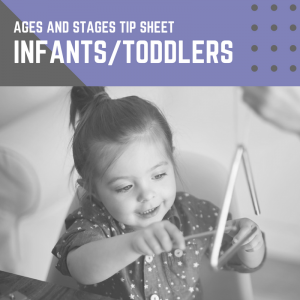 Use this information as a guide to help you choose media that are best for your infant and toddler. Some videos claim that your baby will become smarter by watching them, but evidence shows that this is not true. Help your baby learn real-world skills through playing games like peek-a-boo or other screen-free activities. Background TV can distract infants and toddlers while they play, taking time away from the activities they are doing and the skills they are learning. Turn off the TV when they are eating, playing, and sleeping. Listening to music can help infants and toddlers with their brain development and increase their language skills. Play instrumental or music with toddler-friendly lyrics at soft volumes, so that they can move to the music or begin to sing along. Playing games with music, such as clapping along to a song, can help toddlers develop coordination skills and learn how to interact with others. Listen to music with a beat and play games with your baby as you listen. Reading to your infant or toddler will help lay the foundation for your child’s developing language skills. Choose books that are written for young children and that your baby enjoys. Reading with your child can help strengthen the parent-child bond. Talk to your infant and toddler about what is happening in the book, and point out interesting facts and pictures beyond the text. Interacting through video chat can help infants and get to know distant friends and family, and may help with their language development. Use video chat like FaceTime and Skype with your baby to interact with far away friends and relatives when unable to meet in person.